Connecting student assessment to student work in a relevant way continues to challenge many educators. Students today demonstrate an incredible capacity for thinking differently about projects, approaching their work creatively through the dozens of digital resources available to them, and participating in communities where opportunities to communicate and share information are both ample and thorough. Modern students often develop new skills on their own or through exposure from friends, learning from one another and refining a unique signature style that influences their classroom work and school projects. Because no two students are the same, no two assignments or projects look the same either. So, how should they be evaluated? Teachers privileged enough to interact with today’s highly informed and richly creative learners have a duty, then, to ensure that student assessment metrics are representative of much more than percentages and letter grades. With all of the technology and tools available to students to enhance their work comes a whole new set of ways to alternatively evaluate learner progress and comprehension. Whether or not a school is 1:1 or BYOD, teachers whose lessons reflect opportunities for creative-thinking and inventive approaches to problem-solving (both in and outside the classroom) find that student assessment and tracking learner progress become more dynamic and student-focused than task and material-oriented. If students are excited enough about the content they’re learning to use multiple mediums of expression to complete projects and convey their perspectives, then how is it fair to provide one-dimensional feedback, or a grade communicated by a single number or letter? When implementing technology in the classroom (or, at the very least, grading projects where students have used technology), many teachers struggle to provide adequate feedback when there are so many unconventional ways for pupils to express their understanding of a topic. Practicing alternative methods of evaluating student work (such as grading on concepts like creativity and originality) together with delivering feedback in ways that invite students to interact are essential for today’s educators. “An Unexpected Skill — Thinking Differently“ and “What Does Student Assessment Look Like in a Modern Classroom?” (the latter of the two offers several neat ways for teachers to communicate with students directly through their work). 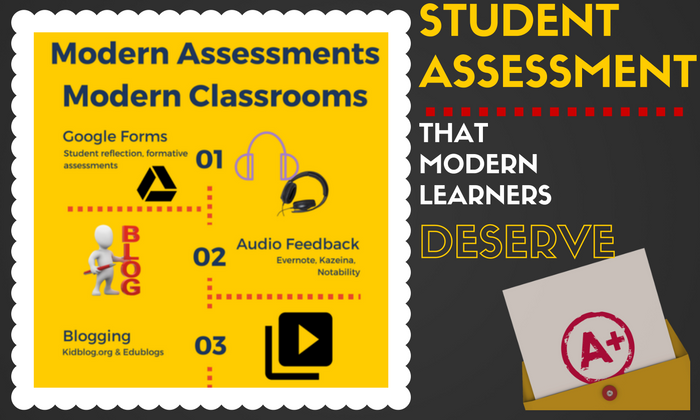 These posts are rich with examples of popular classroom multimedia tools used by today’s students, as well as ways in which to engage learners in the assessment process by utilizing platforms that are native to them, like social media and audio/video tools. Jenny teaches two upcoming Eduspire courses on these topics, to guide educators through the process of not only creating interactive classroom lessons and learning environments using tools familiar to modern students, but to help educators evaluate alternative methods of student assessment using such resources. Both of these courses are excellent options for teachers seeking interactive graduate-level courses that will not only enrich their content and bring their classrooms to life, but expand their personal learning networks and help them to practice assessment that is student-focused and relevant. Join us for either of the options below, and click on a course title to register.